Commercial Wearout – Stage an advertisement reaches after being printed or aired so many times that its effect on the brand’s sale is zero or even negative. 1. Execution level granularity of both sales effectiveness and media spend. The research literature abounds with evidence that wearout occurs at the individual ad level. Two ads within the same campaign can have very different levels of wearout depending on their initial sales effectiveness and media placed behind them. If the measurement approach does not take this into account, these two factors will be convoluted, resulting in misinterpretation of the data. Take this case study as an example. The advertiser launched a campaign of three sequentially aired television ads. 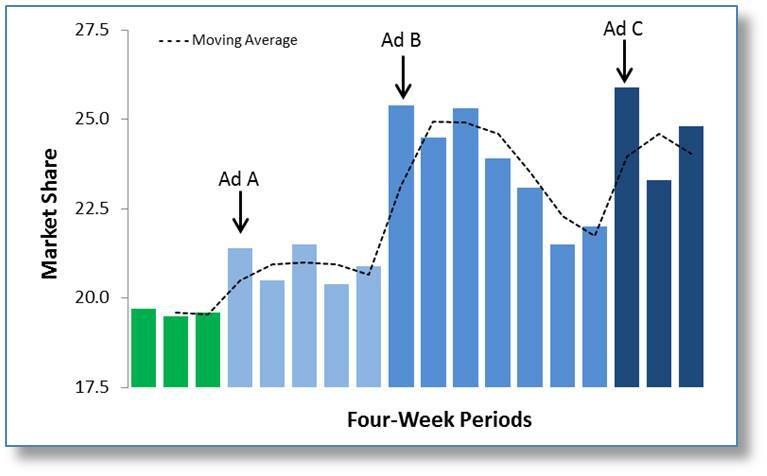 The green bar in the chart indicates a base period without advertising, while the blue bars indicate when the ads were on air. The dotted line represents the moving average market share which gives an indication of sales effectiveness relative to the base period. From this view it appears that the ads hit their wearout point midway through the campaign as indicated by the moving average flattening out at the third airing period. The implication is that the ads are well overdue for replacement. Here is the same case with a more granular view. 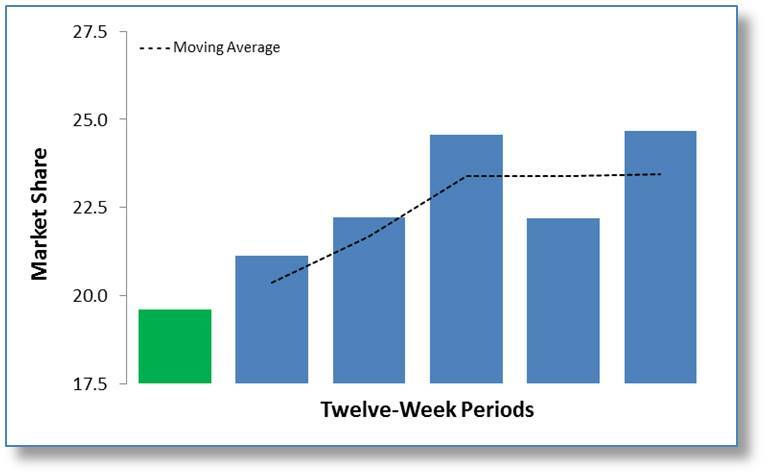 Four-week periods replace the twelve-week ones. And instead of looking at the three ads in aggregate, each ad’s airing is indicated. This chart tells a very different wearout story. Rather than a flattening, it shows a very aggressive battle for market share, with ads B and C being particularly effective in driving gains for the brand. While ad B has been worn down substantially, ad C is still exhibiting some elasticity to sales. In the above example it is easy to see each ad’s sales effectiveness and wearout because the ads were aired sequentially, the media plan was fairly flat with few hiatuses and the advertising was so powerful that it dwarfed other factors within the marketing mix. This is unusual, as the vast majority of campaigns include ads aired simultaneously, more varied media plans and advertising that generate more modest share changes. Because of this, even the most sophisticated market mix models can have difficulty accurately assessing wearout. A useful rule-of-thumb is that if the model cannot provide a statistically sensitive sales impacted estimate at a given GRP level (e.g., sales decomposition beta weight at 500 GRPs) for each ad unit, then the estimates of wearout are likely to be impacted by this convolution. Another caveat is that even when the data is sufficient for the model to provide reasonable estimates, oftentimes the analysis period is too long for the results to be actionable. 2. Metrics correspond to sales/share changes. An advantage of using decomposition modeling is that the connection to sales is inherent in the method. By contrast, the other research approaches use attitudinal measures (e.g., message communication, purchase intent, ad liking/enjoyment) or behavioral measures (e.g., changes in brand preference, ad/brand recall) as a stand-in for sales. Typically, attitudinal measures are ineffective in measuring wearout because the over-time relationship to sales response is weak. For example, while an ad’s ability to communicate a certain key message can be an important contributor to sales effectiveness, its ability to do so at one hundred GRPs is roughly the same as it is at five hundred GRPs. This pattern holds true even for some behavioral metrics. The table below shows the results for 32 television ads tested before airing and then again after airing. Two behavioral metrics were investigated. One is proven ad and brand recall. In this measurement, respondents were incidentally exposed to advertising within consistent television programming and then later were queried to both describe the ad and to name the brand, thus verifying their recollection of it. The other is the CCPersuasion metric. This is the observed shift in brand preference among the competitive set given an actual acquisition opportunity (in this case a prize drawing). This is much different than attitudinal persuasion (aka purchase intent) which is simply a verbal commitment to try the product at a later date. The amount of airing randomly varied between the two tests with the minimum being 232 GRPs and the maximum 2806. The median media weight between tests was 1018. The first thing to note is that the recall measure showed very little variation between the pre-test and post-test regardless of the media spend level. CCPersuasion on the other hand was very sensitive to airing, with all thirty two ads showing a decline. On average, CCPersuasion lost 47% of its value between tests, with the degree of drop in direct relationship to the amount of airing. This drop in CCPersuasion level has been shown to be consistent in over one hundred and fifty cases covering one-hundred eighteen brands competing in fifty one categories. 3. Isolation from other in-market effects. One final area which impacts the ability to properly isolate wearout is variation in programming context between the measurement times. For example, if a media plan uses more expensive, higher engagement placements early in the rotation and less engaging placements later, then the drop in effectiveness seen will be a combination of wearout and the shift in placement quality. 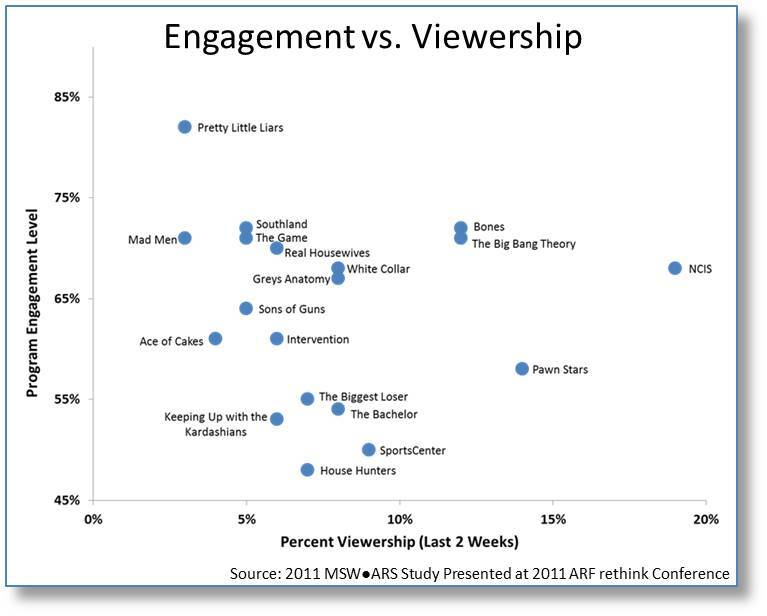 And since program engagement can vary significantly among shows with similar viewership ratings, even plans with consistent media placements will experience this variation. In-market tracking and post-testing systems are especially vulnerable to such deviations, oftentimes with ads exhibiting what appears to be a “spontaneous recovery” from wearout when in reality it is simply a shift to more engaging context. In short, it is easy to be fooled by these factors, even coming to the conclusion that the wearout phenomenon is either unpredictable or, on the opposite side of the coin, rare or non-existent. But by employing a wearout monitoring program that avoids these pitfalls the quantification of wearout becomes as straightforward as the concept itself. And the rewards for doing so are high. In one published case our client experienced a five-fold improvement in campaign ROI just from managing wearout!